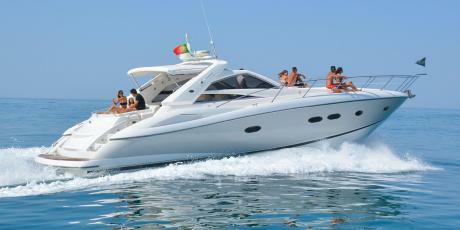 Luxury Boat Charter Vilamoura, Algarve, Portugal. Come and Join us on our Luxury Boat Charter along the Algarve Coastline. We are the finest boat charter provider in the Algarve. 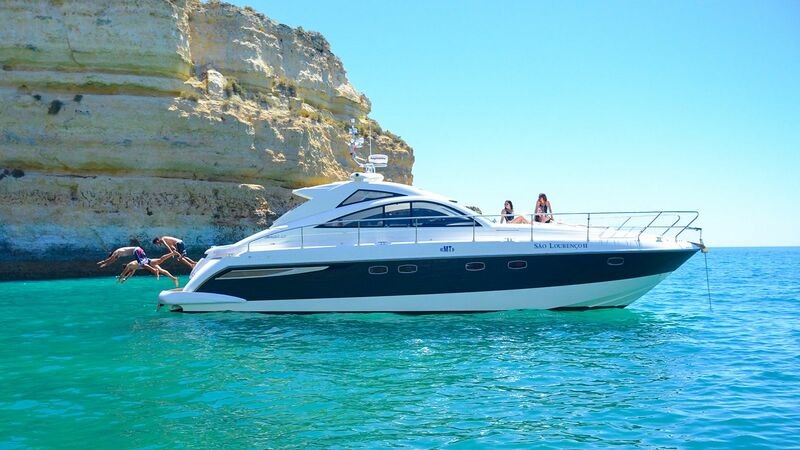 Perfect for exploring some of the most beautiful and remote parts of the sunny Algarve our Sunseeker Boat Hire in Vilamoura is exactly what you're looking for. We offer the very best in Boat Charters and Party Boat Cruises across the Algarve. Come on board the Sunseeker Boat Hire in Vilamoura and enjoy a perfect getaway with a stunning view of the Algarve Coastline on this beautiful Boat Charter. Luxurious and spacious, this exquisite luxury yacht hire let's you escape into the Atlantic Ocean and enjoy the breath-taking scenery of the Algarve and allows you to delve deeper into the caves along the coastline. Sit back, relax, hope on board this Sunseeker Portofino 53 and enjoy some champagne as you cruise on our Boat Charter. We specialise in Personal, Private and Exclusive Boat Charters. Whether it is provisioning your yacht charter boat hire with your favourite wine, arranging a surprise Anniversary Party, Honeymoon or Proposal, your captain and crew will ensure that once you step aboard your boat charter, you will have the time of your life! Majestic Sunseeker also has a large swim platform, a well stocked wet bar and a great sound system! Everything you need for the perfect day and evening. The Atlantis Gobbi 47 is a high end power yacht great for a private yacht hire. Travel in style along the Algarve Coastline on board this private boat hire in Algarve yacht charter. Perfect for either romantic trips for two, or bigger groups of friends. Whatever your taste is, Atlantis boat charter caters for all. The sophisticated and sleek Atlantis / Gobbi 47 Boat Charter is ideal to enjoy a boat cruise and yacht charter along the beautiful coastline of the Algarve from the Vilamoura Marina, Portugal. Well known for its refined design and high performance, this Private Yacht Hire welcomes you onboard our luxury yacht charter for a great day at sea on this Atlantis Gobbi 47. Ideal for either romantic trips for two, or bigger groups of friends or families, Atlantis II boat charter caters for all. With lean and sleek exterior lines allowing maximum deck space for entertainment and a double sun berth with cushions on top and an open cockpit, Atlantis II makes the perfect boat charter in the Algarve! Relax and travel in style along the Algarve coastline with a glass of champagne, watch the sunset enjoy this boat charter! Our São Lourenço Fairline Targa boat is Vilamoura Marina's most luxurious yacht charter boat in the Vilamoura Marina, Algarve, Portugal. 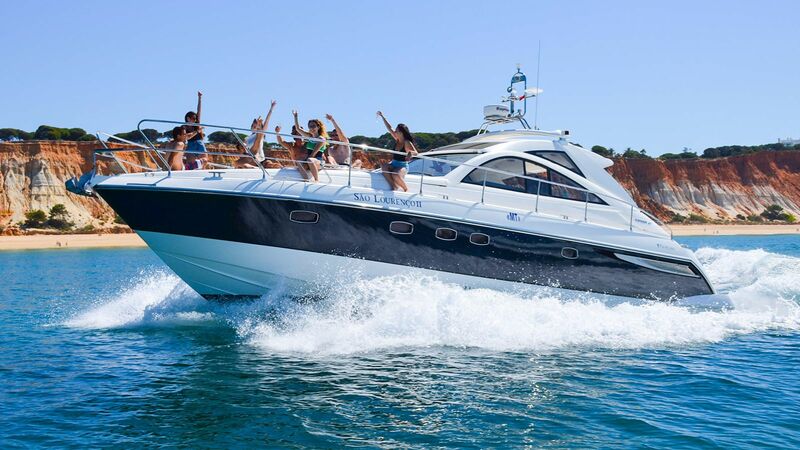 This luxury boat charter Vilamoura has the perfect size for comfort and exploring, making it the first choice for chartering while enjoying the Algarve on this luxury boat rental. 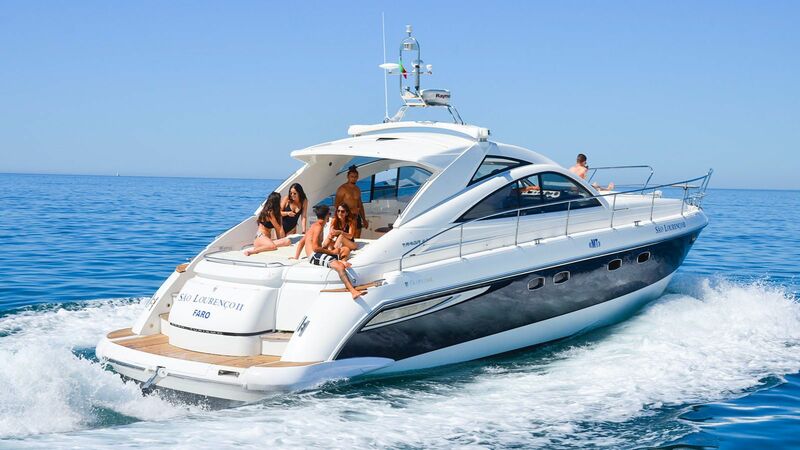 This Fairline Targa luxury boat rental is the perfect size boat charter in size and comfort for exploring your stay in the sunny Algarve, Portugal. Moored at the Vilamoura Marina in the Algarve, this Fairline Targa 47 Luxury Boat Charter is everything you need to enjoy life on water. This stunning luxury boat takes up to 10 people on board and has ample sunbathing areas for pure luxury! São Lourenço also has a Jet Rib in the garage ready for you to try your hand at Wakeboarding, Water Ski and Inflatables! Sit down, relax and enjoy this amazing boat cruise along the Algarve Coastline. 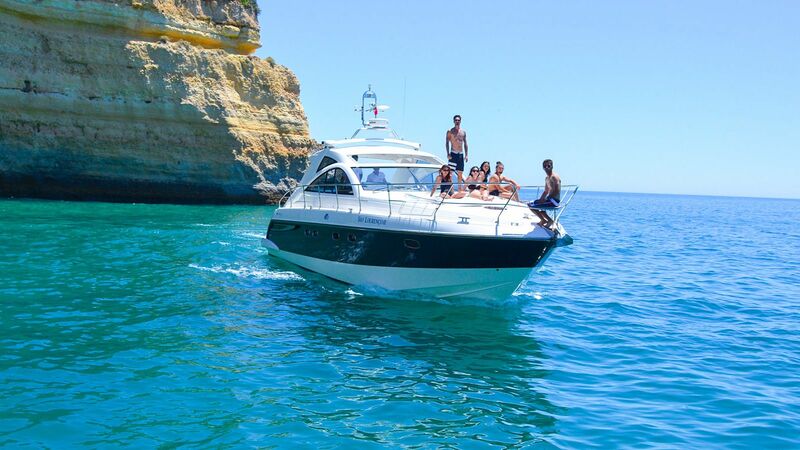 Here at Boat Charter Algarve we pride ourselves in offering the best yacht charters in the Algarve region in Portugal! If you're looking for the best prices on boat rental, you are sure to get the best for quality and service with our luxury yacht charters. 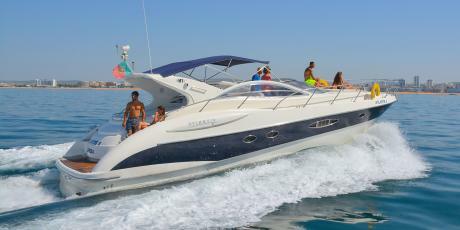 This Cobalt 240 speed boat hire is best suited for those who are looking for a fast and speed boat hire along the Algarve Coastline. If you are feeling a bit more adventurous and looking for some adrenaline, you can try out wakeboarding, water ski or inflatable and many other water sports with this amazing speed boat hire in Algarve! Our Muts Knuts - Cobalt 240 Bowrider is an attractive and versatile speed boat that offers an impressive top speed for anyone looking for a speed boat ride! Join us on board this beautiful and fierceful speed boat charter and enjoy this boat cruise across the Atlantic waters overlooking the Algarve Coastline. Hire this speed boat by the hour and we guarantee you will have an amazing experience! With a great sense of fun and adventure, take advantage of this speed boat charter and explore some of our most adventurous activities like wakeboarding, water ski, inflatables, among many other watersports! Come aboard one of the many Luxury Yacht Charters we have available for you in Vilamoura, Algarve, Portugal. Sit down, relax and escape with us on our Luxury Boat Charter Vilamoura across the Algarve Coastline. 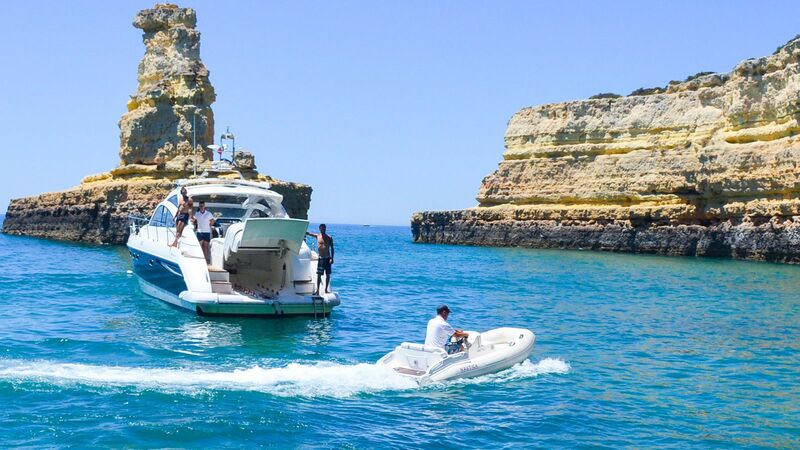 Available for private boat charter, our Morning Boat Charter is an amazing boat cruise that offers an exhilarating way to spend your stay in the Algarve. Visit us at the Vilamoura Marina, and we guarantee we'll have the perfect boat charter for you crossing the spectacular Algarve Coastline. Prepare yourself for pure indulgence with our Algarve yacht charter cruise in the Algarve. Join us at Champagne Cruises Vilamoura Boat Charter and charter one of our stunning boats. Enjoy a sunny and relaxing afternoon boat charter cruise across the Algarve Coastline. We offer a fantastic choice of boat charters in our charter fleet available for private charter. Cruise along the Algarve Coastline through the stunning rock formations and celebrate your birthday, wedding anniversary, marriage proposal or party on one of our Full Day Boat Cruise in the Algarve, Portugal. Relax and escape with us on this Sunset Boat Cruise along the Algarve Coastline. Departing from Vilamoura Marina, you are sure to be on your way to make a lifetime memory on this boat charter cruise! Experience this amazing Boat Charter and enjoy the view of the Algarve Sunset. Come and experience VIP service onboard on of our exclusive private boat hire in the Algarve, Portugal. Cruise along the sunny Algarve Coastline and experience living the dream millionaire lifestyle in luxury style! Come to Boat Charter Algarve and enjoy this private boat hire cruise moored at the Vilamoura Marina, Algarve, Portugal! For those more adventurous, this activity yacht hire cruise allows us to build the perfect selection of adrenaline pumping into your boat charter of choice! With Jet Skis, Inflatables, Parasailing and much more, you are guaranteed to have a fantastic time! Can not put into word how amazing the experience on the majestic was. 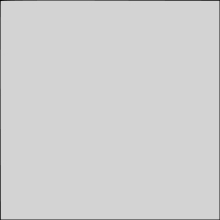 Beautiful and clean. To top off the experience, Eric and Edwardo was so friendly and telling us loads of history about the beaches and caves, always asking if we was ok for drinks, nothing was to much for them. Would recommend that if you book ask for them two. Thank you for the experience it really made our holiday special. 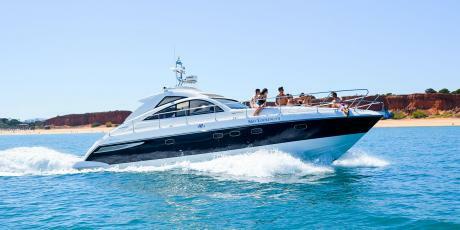 Went out last week on a yacht charter from Vilamoura Marina on a Sunseeker Portofino 53. There was 8 of us took the boat on a full day charter from Champagne Cruises Vilamoura the office staff were very helpful we had a fantastic day out on the water the skipper was the best part of the trip super friendly and made us feel like we had known him got years big shout out to Tiago by fair the best Yacht Charter in the Marina. Had a great time with kids said now we have to charter a yacht every time we come to Portugal. See you again very soon! Money well spent, highly recommend it 5 stars! If your planning a visit to Vilamoura and you want to do something special I can suggest only one charter company. I have been booking with champagne cruises for the past 5 years. Fantastic cruises tailored to your needs just speak to John or Edgar who are extremely helpful ,friendly and are there to assist if needed. They are online or give them a call to book as they are very popular. Now the crew, Tiago, Edwardo and Henrique are three of the nicest knowledgable people I've met. They are amazing at what they do they make you feel safe and are happy to provide the best experience and show you the best parts of the algarve. Edwardo is a fantastic driver/captain and I have always requested him. I have had great experiences over the years, from the speed boat mutts nuts to the luxury yacht majestic and I have only ever booked with these guys for my excursions. I have to be honest if you just tell them what your wishes are they will do their best to ensure it happens. They have different excursions for all needs and the prices vary no it's not cheap but it's well worth it, memories are priceless and this experience is something you can cherish forever. It's all about the service and warm welcoming staff and crew. They rate 10/10 for me and my whole family. Thank you all and see you next summer. Booked a lovely sunset cruise for a romantic evening wit my girldfriend we thoroughly enjoyed. The boat was luxurious and the crew were great! We would recommend this trip to everyone. Hope to visit again next year! Thanks for a great tme! We booked (for a second time) with Champagne Cruises. It was a birthday treat for my wife and we want with our 3 daughters (14 yrs to 24 yrs old). It rained all afternoon and yet it was a 5 start trip. We went on the Sunseeker 'Majestic'. The captain and crew were fantastic. By the time we'd drank 5 bottles of the free champagne, seen a pod of dolphins (which the captain went our of his way to find) and all jumped off the boat to swim in the coves; we couldn't have cared less about the rain! Fabulous value, latest music, great hospitality and unlimited drinks. My only tip would be to take an aux lead to play if you want to play your own music through the amazing sound system and take towels if the weather is cooler. We booked this in advance for our 20th Wedding Anniversary. Paid 50% up front and the remainder on the night. The boat was a real treat cruising to the Caves and back. The champagne kept flowing and the staff, Tiago and Fernando were the perfect hosts. If you want to use the ringo or swim you really need to book this for longer than the 2 hr cruise otherwise it would feel too rushed.